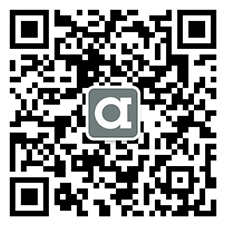 Abcam's AKT Activity Assay Kit utilizes an Akt-specific antibody to immunoprecipitate Akt from cell lysate. Activity of the Akt is then determined in a kinase reaction using recombinant GSK-3a as substrate. 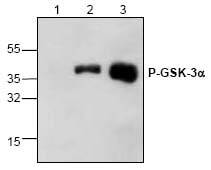 Phosphorylation of the GSK-3a can be analyzed by Western blot analysis using the phospho-GSK-3a specific antibody included in the kit. The kit specifically detects Akt1, Akt2, and Akt3 activities, other kinase activities would not be detected. The AKT Specific Antibody reacts with human, mouse, and rat. Akt is a protein kinase that can be activated by insulin and various growth factors and functions in a pathway involving PI3 kinase. Recent evidence suggests that Akt functions to promote cell survival by actively inhibiting apoptosis. Western blot analysis of phospho-GSK-3 alpha in AKT negative (Lane 1) and AKT positive (Lane 2,3) Jurkat cell lysates using AKT Activity Assay Kit (ab65786). 1 - Does the kinase buffer contain protease inhibitors or phophotase inhibitors? If not, should they be added and how do they effect the experiment? 2 - Are there any modifications for this protocol for tissue samples? The kinase buffer contains PMSF, Na-vanadate and Na-pyrophosphate and EDTA. Typically nothing more is required to protect the Akt enzyme activity. Additional protease inhibitors might be added if desired. This should not affect the assay, but addition of more protease inhibitors and phosphatase inhibitors has not yet been tested. Tissue samples should be homogenized in the extraction buffer and then centrifuged to obtain a clarified homogenate which can be used in the assay. Kindly contacted us to inquire about the Akt specific antibody used in this kit. I have been informed by the lab that the antibody used in this kit is not a phospho specific Ab. The immunogen spans the N Terminal of the protein Akt. The AKT Activity Assay Kit (ab65786) can be used to detect akt activity in human, mouse, and rat tissue extracts and cell lysates. I know the AKT can be detected in colon tumours, I don't know about liver.I would encourage youto consult the latest literature available through PubMed and other resources in order to find the most up-to-date information about this specific research field. I hope this is helpful andI hope that the available literature in this area can provide some clarification about AKT in liver. Please do not hesitate to contact us again.